Man-Made Snow: What Are the Environmental Effects? Global warming is real, and it’s beginning to shorten our snow seasons. The most realistic solution to this crisis is to make our own, artificial snow, a practice that has been going on since the 1950s and one that has been in the news lately with new technology allowing resorts to make snow in warm weather. Snow-making machines have advanced in efficiency but, the real question is, is the snow worth the energy spent to produce it? Ski resorts across the country use snow-making machines. It’s certainly not an uncommon practice, and it’s rarely seen as a huge environmental threat. But it is definitely something worth taking a step back and dissecting. When looking at snow-making machines from an environmental perspective, there are two major sacrifices that we make when using them – water and energy usage. First off, it’s important to get a basic understanding of how these snow machines work. Though there are many manufacturers and models, which operate at different efficiency levels, most utilize the same common design concepts. Some places, like this resort in Arizona, couldn’t run without snow making. First, water is broken up into smaller particles. Those particles are then cooled to 32 degrees Fahrenheit. The heat of fusion is then removed and the particles nucleate and form ice. I know a lot of that probably doesn’t make a ton of sense, so think of it this way – an artificial cloud is formed with water droplets that are super-cooled below freezing temperatures, at very fast speeds. Some modern machines form snow that is relatively dry, in order to slow down the rate that it melts. The snow is then dispersed through the use of an air compressor, or a fan, which blows it on to desired slopes. The most common practice is to pump water out of reservoirs, streams, or lakes. Recently, some resorts have taken the step to use highly treated sewage water – a controversial practice. One potential problem with the displacement of water is more-so the displacement of what’s in the water. There have been instances where minerals such as zinc, copper, lead, and other metals have been found in water being used for snow. Even if it is clean water being used, taking water out of streams and lakes can have some seriously negative effects on aquatic life. Especially in the fall months, when trout are spawning and temperatures are changing. This may not sound like a tremendous environmental impact at first glance, but a large amount of water is needed when making snow. According to snowmakers.com, it takes 74,600 gallons of water to cover a 200 by 200-foot plot with 6 inches of snow. A snow making operator gets Heavenly ready to roll for the season. While water is a renewable resource, energy is not. 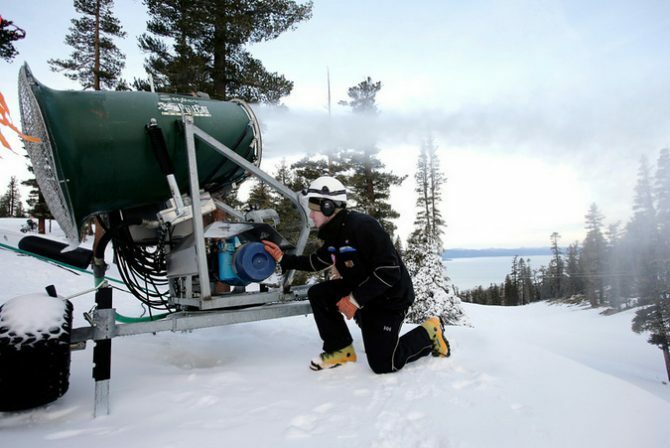 Some resorts are setting an example by creating new ways to power their snow-making equipment. Jiminy Peak, in Western Mass., uses the help of a wind turbine that provides 4.6 million kilowatt hours of energy – that equals out to a third of the entire resort’s energy usage. This is exactly the type of proactive answer we need: being a part of the solution. In the big picture, snow-making certainly does require a lot of energy, however it does not compare to many other energy-hoarding practices that exist today. “The energy use is the most concerning thing, but we have way bigger problems than snow-making,” Steinkamp said. When it’s all said and done, it’s unlikely that we’ll see less snow-making. And that’s probably okay. But, as members of the snowsports community, it’s our responsibility to be stewards of the land and try to protect the future of our sport and continue to stay informed.